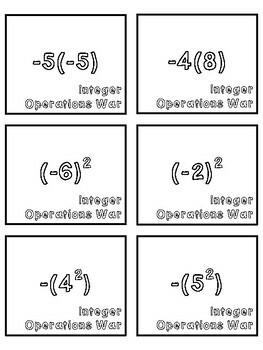 These cards are an excellent way for students to practice integer operations in small groups! I love to use these as a a station when we do rotations because these skills are always a topic that needs reviewed, and it requires very little supervision after they are taught initially. The game is played just like the classic war card game. It can be played with pairs, small groups, or even independently as flash cards. You could also use these as task cards! 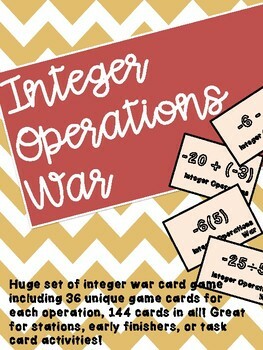 The set comes with 36 of each operation, for a total of 144 cards! 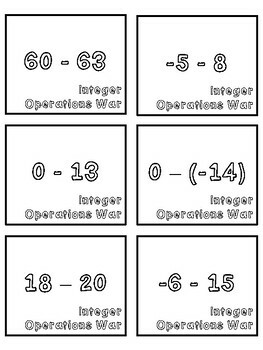 I also included an integer operation reference chart for you to keep at the station or give individually to students. I printed the card games on bright cardstock, cut each card out, and laminated the cards so they would last the longest. 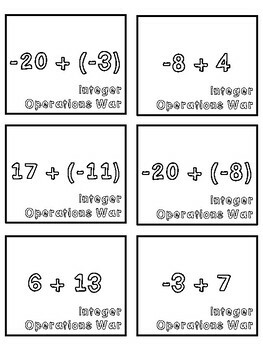 I have one set of them separated by operation, and I printed another set with addition/subtraction grouped together and multiplication/division grouped together for mixed practice. Enjoy!